DESCRIPTION: It was my great pleasure to interview Njabulo Simakahle Ndebele about his latest book, Fine Lines from the Box (Umuzi) at the recent Cape Town Book Fair. I’m thrilled that I now have the opportunity of sharing this wonderful conversation with you as a ‘live’ podcast, the second live podcast in my series of Literary Podcasts. I have no doubt that I’m not alone in regarding Ndebele as one of South Africa’s greatest intellectuals. He is known for writing that always raises the bar, and each page of his writing sizzles with lexical gems that are anchored in deeply considered thought. 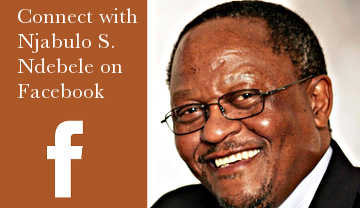 Ndebele has held the position of Vice Chancellor at two universities in South Africa, and is the author of short stories, novels and essays that have been more influential on South African thought and imagination than, it can well be argued, any other single voice. Apart from ‘Fine Lines from the Box’, his books include the monumental ‘Rediscovery of the Ordinary’ and ‘Fools and Other Stories’, and the post-modern fictional meditation on South African identity, ‘The Cry of Winnie Mandela’….